So indulge me please as I dedicate a posting to Wales and the Welsh in poetry and prose from the First World War. You should expect nothing less from a Griffiths on March 1st. A quick story. My wife is American and over a decade ago, before we married, I took her back to visit the Welsh town where I’m from. It’s a place called Llanelli. That weekend the national rugby team were playing at Llanelli’s famous rugby ground, Stradey Park. A marching band were in attendance and the crowd, jammed into the little stadium, were singing traditional Welsh songs with gusto: Sospan Fach, Calon Lan, Cwm Rhondda. It was a great warm up to the big game. The marching band began to come down to our end of the field. My wife, a little disconcerted, points to the band. She points to the front of the band. There is a goat being led on a rope by a soldier in a red coat and white hat. People are cheering. ‘Oh, that’s the regimental goat,’ I say. ‘The regimental what?’ she says, laughing. At this, the American erupts into laughter. “I love it,’ she laughed. ‘A goat. At every game. Great!’ There followed a number of comments about how small the ground was, how great the goat and the singing was. She even enjoyed watching the rugby. Reader, I married her. So why on earth was there a goat at the game? Shenkin was the mascot of the Royal Welch Fusiliers. Army regiments across the world often have peculiar traditions and rituals; a culture all of their own that their soldiers preserve. The story of the goat goes back to Victorian times and the Crimean War, when the goats were actually eaten by the soldiers. One night, after a sentry fell asleep on duty, a goat woke up the regiment as the Russian enemy started to attack, saving the men present from massacre. The Royal Welch have had a goat for a mascot ever since. 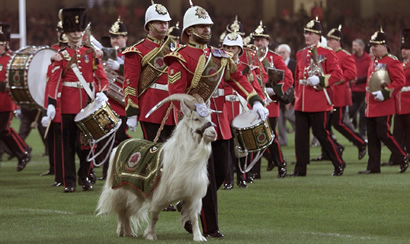 Since the regimental system has always been tied to particular areas, the Royal Welch– and its goat– have represented Wales and Welsh pride for many years. And in terms of reading about the First World War in poetry and memoirs, Welshmen, the Royal Welch– and other Welsh regiments– are better represented than many others. Why? Two great literary names, to start with: Siegfried Sassoon and Robert Graves. Neither were Welshmen but both were officers with the Royal Welch Fusiliers and their brilliant accounts of the First World War, ‘Memoirs of an Infantry Officer’ and ‘Goodbye to All That’, memorialise the actions of the Royal Welsh at infamous battles like that of Mametz Wood. These aren’t patriotic accounts: as Graves noted “Patriotism, in the trenches, was to too remote a sentiment, and at once rejected as fit only for civilians, or prisoners. A new arrival who talked patriotism would soon be told to cut it out” (p.157, ‘Goodbye to All That’, Penguin 1960). 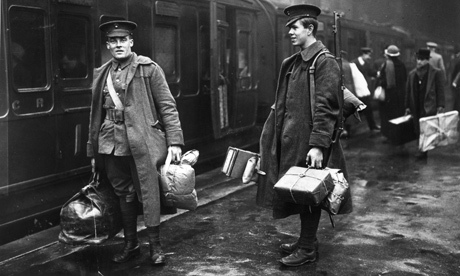 But they do give intense pictures of what Welsh soldiers were like in the First World War. Graves also spent time with the Welsh regiment (Note the difference in spellings!). The Welsh Regiment was a “rough and tough” regiment, less professional than the Royal Welch. Non-conformists and North Walian hill farmers– stolid, highly independent people– were among their ranks. Here’s an atmospheric account of the Welsh– and Graves– going to the trenches for the first time, under bombardment. Collecting the draft of forty men we had with us, we followed… through the unlit suburbs of the town– all intensely excited by the noise and flashes of the guns in the distance. None of the draft had been out before, except the sergeant in charge. They began singing. Instead of the usual music-hall songs they sung Welsh hymns, each man taking a part. The Welsh always sang when pretending not to be scared; it kept them steady. And they never sang out of tune. Another great poem that doesn’t feature in the anthology is Ivor Gurney’s ‘First Time In’. Ivor Gurney is one of the most underrated war poets of the First World War: a talented composer but mentally brittle, he went mad after the war’s end. He leaves us this poem about going, like Graves, up to the front for the first time– and encountering, to his surprise and wonder, a Welsh regiment. Ulysses found little more in his wanderings without doubt. Are sung — but never more beautiful than here under the guns’ noise. I realise that I haven’t even mentioned Wilfred Owen, an English son of the border country, with a great love and longing for Wales. Neither have I dwelt on the remarkable Welshman David Jones, a private in the Royal Welch, whose work I shall be returning to very soon: but time, I’m afraid, doesn’t permit. Let me then end somewhere near I started, at Stradey Park, listening, with my wife-to-be, to the crowd sing ‘Sospan Fach’. ‘Sospan Fach’ is one of Wales greatest folk songs, a shaggy-dog story about a Welsh housewife having a bad day. I once told an Irish friend what the nonsense-lyrics meant, and he was tremendously disappointed. “I thought it was about God or angels, or something of that kind”, he laughed. Attuned their mouths to harmony. Of lost souls for their cottage fire? With Fusiliers in Mametz Wood. There stayed unbroken not one twig. 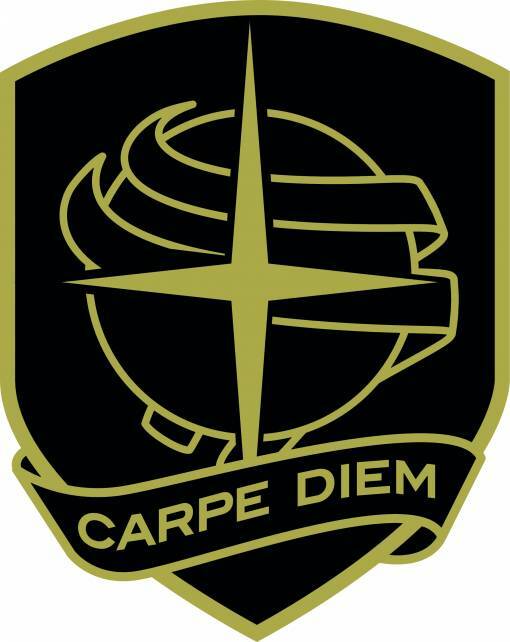 Emblem of hope and ease gone by. The death-trap sounded with their din. Another note would break my heart! Author G. M. GriffithsPosted on March 1, 2011 December 9, 2011 Categories First World War, History, Marching Songs, Music, Patriotism, Soldiers' Songs, WalesTags Everyone Sang, First Time In, First World War, Goodbye to All That, Ivor Gurney, Memoirs, Poetry, Robert Graves, Royal Welch Fusiliers, Siegfried Sassoon, Sospan Fach, St. David's Day, Wales, Welsh Regiment1 Comment on Happy St. David’s Day!